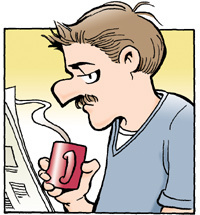 Mark was introduced in 1970, the strip’s first year of publication, as one of Mike Doonesbury’s friends and classmates at Walden College. Mark was the most outspokenly liberal member of the cast. As such, Mark was shown involved in protests. As the years wore on, Mark eventually became a student radio station DJ. Mark’s conservative businessman father didn’t think much of Mark’s new job. 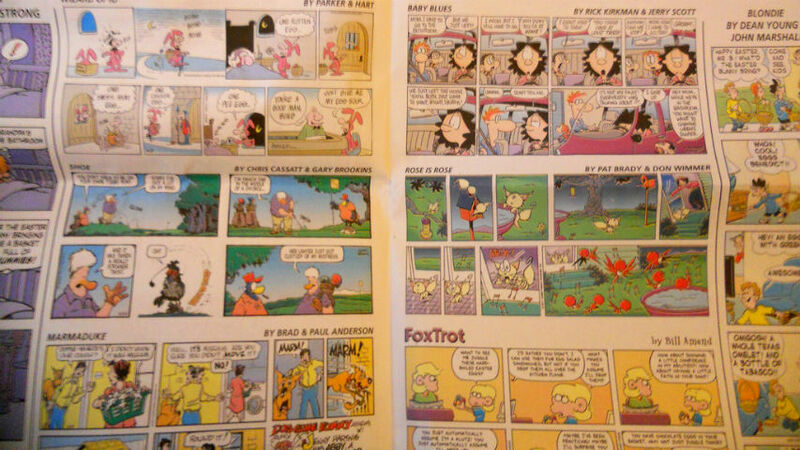 The two not seeing eye-to-eye with each other on, well, anything, became a recurring theme in the strip. Trudeau finally allowed the cast of characters to start aging and graduate in 1983. This started with “Doonesbury: The Musical,” a stage play version of the strip performed during the strip’s then-two-year hiatus. After the strip came back from hiatus, it was revealed Mark had become a talk show host for NPR, the job he still holds to this day. Since the strip’s advanced in real time since 1983, Mark’s brown hair has become all white by now. (The picture I used in this post dates from the 90s.) This was pointed out in one of the strip’s fourth-wall-breaking letter-answering sequences. A (fictional) reader writes in to ask why Mark hadn’t aged as well as the rest of the strip’s Baby Boomer-aged cast. Besides being Jewish, Mark also was revealed as being gay in a mid-1990s storyline. Mark decides to come out after a dream sequence featuring Andy Lippincott. Andy was an openly gay secondary character who’d died of AIDS-related complications in a storyline several years earlier. Since then, Mark spent a period of time in a relationship with Chase, a conservative Republican. However, the relationship eventually ended. Previous Post:Are Nickelodeon and SpongeBob worse than DC/WB and Batman?